Can you believe it’s been over 30 years since Rocky III and the introduction of Mr. T as Clubber Lang? Damn, that makes me feel old. Just the fact that I saw Rocky III in the theaters makes me feel a little old. Nothing to do with the review, this song was just going through my head the whole time and I had to share. I bet most of you are seeing this for the first time (and hanging and shaking your head to think that something like this existed…and was fairly popular). It took over 30 years, but NECA finally made a decent, affordable, Clubber Lang. I say affordable, because Hot Toys put out a couple of nice versions a couple of years ago and it can be found on eBay at exorbitant prices…but who can afford eBay-priced Hot Toys? Not me…I’ll stick with this version. NECA packaging has never really ever wowed me. They are still one of the toy companies that use blister packs to package their figures…you know, those impossible to open plastic cages that you have to take a blowtorch to just to open? If you were a mint-in-package collector, that would probably be fine with you, but if you’re not like me and like to take your figures out, just go ahead and toss the package because it’s a wash. The front is pretty generic with a standard card back. 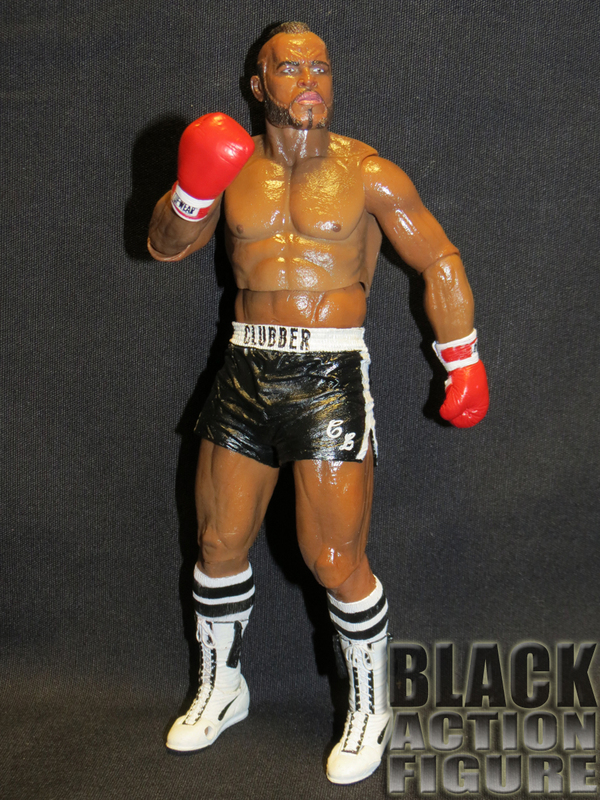 We do get an identification of the figure’s name (Clubber Lang) on the front. 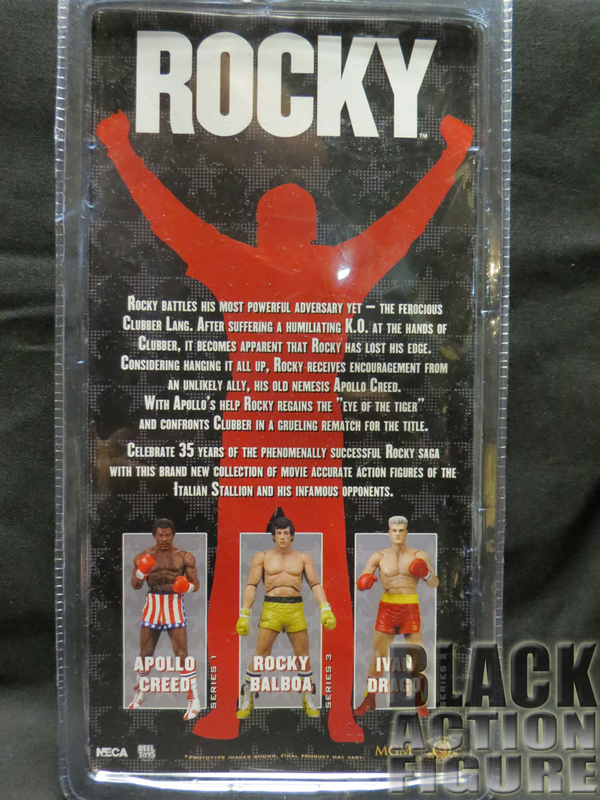 On the back, we get another generic representation of other character’s in the line including Apollo Creed, Rocky Balboa, and Ivan Drago. 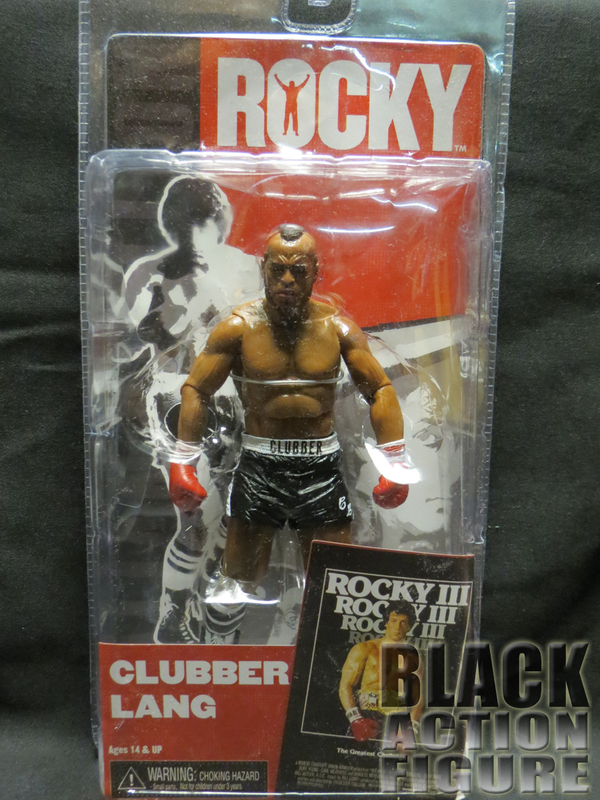 I would like to speak up and say that the Clubber Lang character must be pretty popular…I have never seen him displayed at retail. Mine came from an Amazon order and I was lucky to get him when I did because the price is steadily going up as this figure becomes more rare and popular. This is an easy one….no accessories. They could have included his championship belt or maybe interchangeable hands, but no luck. You get the figure and that’s it. Enjoy it! NECA always does a pretty decent job in character sculpting and I have seen them get better over the years. 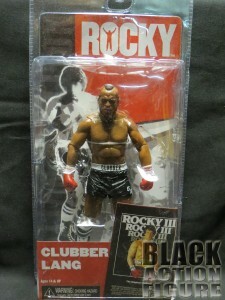 Clubber Lang is a really good representation of Mr. T, the actor who portrayed him. It’s strange to think that Mr. T was ever this young seeing that he is now 61 years old. Customizers of course can go on and make their B.A. Baracus custom action figure from this or you can just go ahead and feel free adding him to your current Rocky collection (mine consists of him and Apollo…no plans to get Rocky or Ivan). I have to also mention that I really dig the detail put into the boxing clothing on the figure. From a distance, you would almost think that it is real material rather than painted plastic. You can see the ripples and wrinkles in the shorts. The laces in both the shoes and the boxing gloves are meticuously sculpted into the figure. The knee high socks remind me of the ones I had back in the day. We even get the tassels hanging from the sides of his shoes. NECA employs some talented sculptors when doing these figures. The paint job is also top notch. There is a glossy look to the figure to almost portray the fact that it is glistening in sweat from being in the middle of a boxing match. 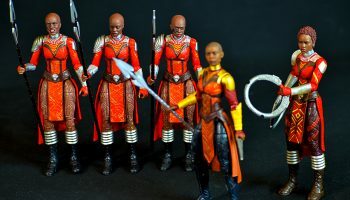 Once again paying attention to detail makes NECA’s figures one of the top collectibles in the business. 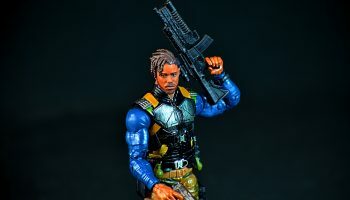 NECA most times does a great job at articulation, but it does come with a warning: many of the joints are stiff coming right out of the package so you have to take care when trying to bend an arm or swivel a knee because it can be very brittle. I have already broken two NECA Predators due to trying to bend a stiff arm joint. 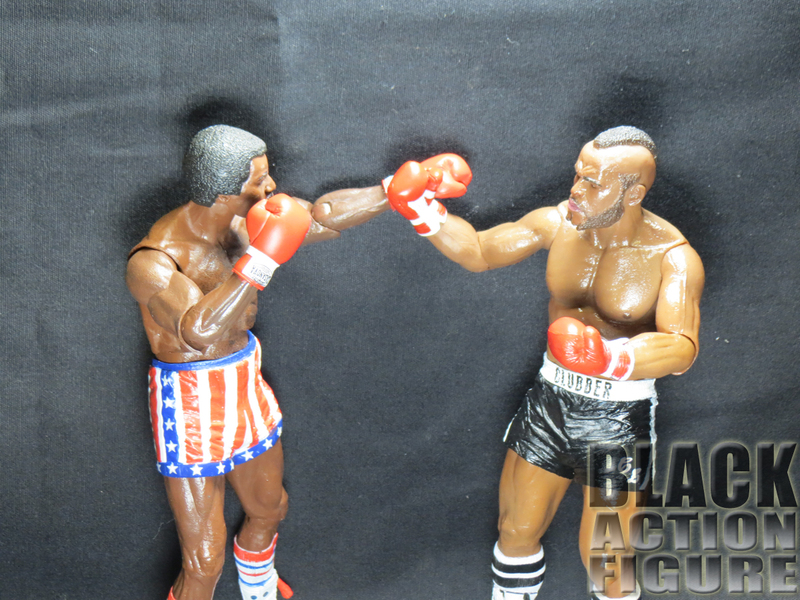 That being said, this Clubber Lang figure comes with over 28 points of articulation, which is great because it makes it very poseable when recreating your Rocky III scenes. 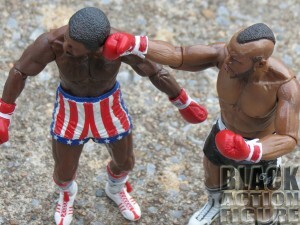 When I finally get my movie room done, I think I will place in it a diorama of Apollo versus Clubber. Some pluses to the articulation include the ability to move the leg…meaning the plastic shorts allow freedom of movement of his legs. Another plus is the added “toe hinge” allowing the figure to get some good crouched down positions. All in all, the articulation was handled pretty well. I’m really happy I decided to pick up this figure. As soon as I got an Apollo figure, I knew I had to have the Clubber Lang one…even if it took me a year to get him. Like I mentioned above, I actually waited to try and get him when he showed up in my local Toys R Us, but I never saw him and either Toys R Us had really low quantities or he was a popular figure, or both. Sometimes, if it weren’t for Amazon, I wouldn’t have some of my figures. 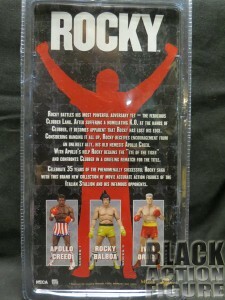 If you’re a Rocky fan, run out and get this figure. 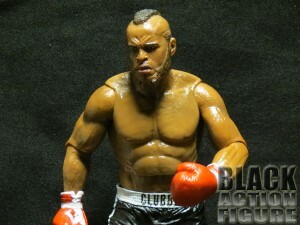 If you’re a Mr. T fan, run out and get this figure. 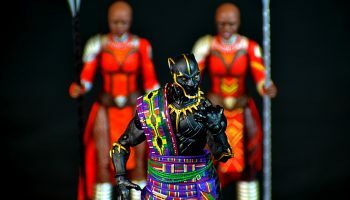 With an impressive sculpt mixed with equally impressive articulation, this figure is definitely a must-have!